Adebayor. 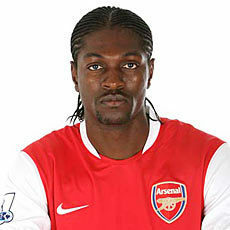 Emmanuel Adebayor, Arsenal striker. Wallpaper and background images in the Arsenal club tagged: emmanuel adebayor arsenal arsenal fc. This Arsenal photo contains jezi, t shirt, shati tee, jersey, tee shirt, and shati ya tee. There might also be polo shirt, shati michezo, and shati ya michezo.